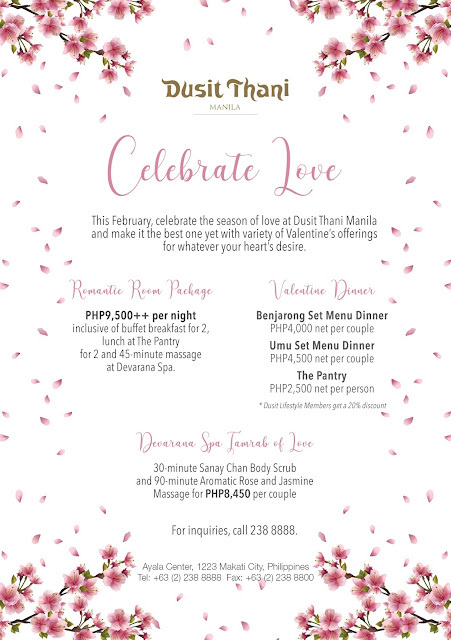 This February, celebrate the season of love at Dusit Thani Manila and make this month extra special with variety of Valentine’s Day offerings for whatever your heart’s desire. Fall in love all over again with the pleasures of a luxurious stay in any of the hotel’s well-appointed guestrooms and suites. With rates starting at PHP9,500++ per night, a romantic city getaway includes complimentary buffet breakfast for two, complimentary lunch at The Pantry for two and 45-minute massage at Devarana Spa for one. On the night of February 14, embark in a gastronomic journey in any of the hotel’s specialty restaurants- The Pantry, Benjarong and Umu, with special Valentine offers that will surely make this year’s celebration the best one yet. Impress your date with the romantic set menu dinner at Benjarong and get a taste of authentic Thai cuisine straight from the heart for only PHP4,000 net per couple. For a more intimate and indulgent atmosphere, delight in an intimate Japanese dinner with your better half at UMU for a set menu priced at PHP4,500 net per couple. You can also treat the love of your life to a lavish dinner and enjoy a delectable spread at The Pantry for only PHP2,500 net per person. Create the perfect romantic mood at Devarana Spa that features a special treatment inspired by the folklore story behind one of the Thailand’s most famous desserts- Sanay Chan. Spend an enchanting time with your special someone while enjoying a 30-minute Sanay Chan Body Scrub and 90-minute Aromatic Rose and Jasmine Massage for PHP8,450 per couple. Devarana Sweet Tamrab of Love is available throughout February. For Room Reservations, call at 238-8888 loc 8200-8203. For Restaurant Reservations, call 238-8888 loc 8430 or 8838. For Devarana Spa, call 238-8856.